Malcom McGregor was born in Newark, NJ, October 13, 1892. Prior to coming to Hollywood, McGregor was an inter-collegiate swimming champion and a "first class boxer" at Yale and "has displayed much skill as in instructor in dancing." (according to the 1924 book "Stars of the Photoplay"). He married after college, and he and his wife, along with some friends, bought a yacht and sailed around the Pacific for awhile (McGregor is said to have sailed the first small boat through the Panama Canal and "spent an adventurous seven months in the Orient.") His father was a millionaire "manufacturer" and wanted his son to go into the family business. However, he ended up in Hollywood after his sailing adventure, met a fellow Yale graduate, Rex Ingram, and was given an opportunity to act in films. His first film appearance was in Rex Ingram's "The Prisoner of Zenda" (1922). His work in this film was well-liked enough that he was put under contract to Metro. 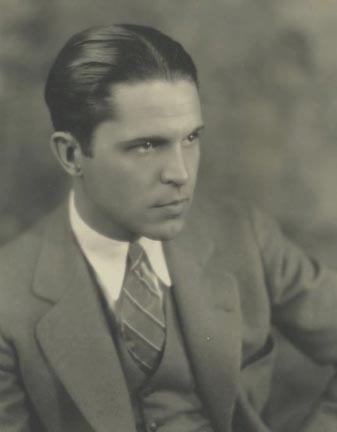 For his second picture, he was chosen by director Allen Holubar to star opposite Colleen Moore in "Broken Chains" (1922), a film that garnered quite a bit of publicity because of its $10,000 Chicago News prize-winning scenario. For his third picture, he starred with Billie Dove and Lon Chaney in "All the Brothers Were Valiant," a prestigious 1923 Metro release. McGregor made over 40 silent films, sometimes starring, sometimes sharing the star billing, and sometimes in support of the star. Not as successful in the sound era, he nevertheless appeared in over a dozen features between 1929 and 1936. Apparently McGregor continued to enjoy sailing throughout his life. An October 1933 newspaper article noted that he and some friends had to be rescued by the Coast Guard off the coast of South Carolina when their sailing vessel was disabled in a storm. They were towed into Norfolk, VA. The boat was owned by Mrs. Lewis Stone. Sadly, McGregor was to die a tragic death April 29, 1945, when he fell asleep in a chair with a lit cigarette in his Hollywood home.